I have a lot to be thankful for with this thing called blogging and one of the best parts is the way people reach out to one another, healing the cracks in relationships, closing the gaps in their fractured spirit, sparking the survivor instinct and making a beautiful item out of a broken one, an art known as Kintsukuroi. If you’ve read my story as a survivor of depression here, you’d know that it is a topic that touches a chord with many people. It is also a frighteningly rampant occurrence across the world today, sparing nobody, not even kids. Soon after the results of the school examinations were declared here in May 2015, I logged in to see the terribly tragic news of a child who had jumped to her death from the tenth floor of her apartment building. While the world and social media launched into the typical tirade against rigid expectations, rigorous parenting, mounting pressures and everything wrong with the education system, I only felt an emptiness. There was a sickening feeling in the pit of my stomach that couldn’t imagine what that child must have gone through in the moments before she took the plunge, a decision that would end her existence forever, the last decision she would ever take before Death took its victim from the broken concrete. If we were wrong to have pushed our kids into academia fifteen years ago, today we are wrong for pushing them into too many vocational, after-school activities. There really is no win-win situation. Nobody treads the middle path anymore. It’s almost as if being average is not all right, not by any margin. So what do we do? We teach our children to be strong, to come to us without fear of consequences and to confide their deepest fears without worry of reprimand. We tell them that it’s okay to fail and mean that from the bottom of our hearts. We comfort them and hug them when they don’t feel like talking about it. And it’s hard, this thing called parenting. So, reading about other survivors and the methods they use can help us. Late last night, a friend sent me this picture and asked me to share it with any survivors of depression or sexual abuse. It was a picture of a broken vessel put back together using shards of gold, to show that there is something beautiful, even in the cracks. 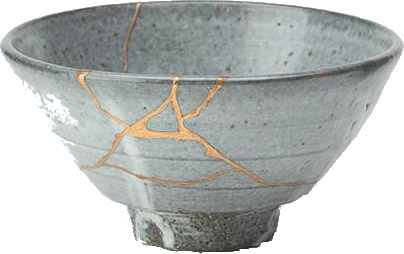 Kintsukuroi, a Japanese art form, fixes broken pottery by sealing the cracks with gold. By doing so, we acknowledge the pain of the past with the hope of the future. It doesn’t get more Zen than this. We are all broken- by our experiences, our failures, our sadness, our depression and our abuse. It doesn’t really matter what we do to feel this way because the world only gets more demanding as the days go by. But we can choose not to stay broken. We can fill those cracks with the touch of love, therapy, kindness, compassion from our parents, peers and our online connections. It’s not going to be eternal- this existence. The least we can do is make every step worth taking. By doing so, we may just make our children’s lives a little more fulfilling. At least, I hope so. Despite having three degrees, I still don't get the reason behind the undue pressure on kids. Yes, basic education is important. But it's even more important that they take a genuine interest in whatever field they enjoy. We need to guide them. Not make it feel like they're going to war. I agree with Sid, don't just get this pressure on kids where they are pushed not to enjoy single moment of life.I'll prefer my kids to be awaal as a good human being rather than academics to boast on my social circle how good they are. It's so sad and I can sense the emptiness in your heart, Shailaja. I think one of the reasons of this pressure is the fact that we don't understand anything beyond Engineering or Medical as professions… And then we have to put the kids in every extra curricular activity and expect them to not only excel in those but their academics too…I think we need to let the children enjoy, breathe and only then can their learning be of any use…Needless to say we may even be able to save some lives then! The pressure is sometimes not only from parents. Its society too. My son who was in X this year started to refuse to go to any friends & relatives house. COZ all they would ask about was studies and future. Especially if the child has not made up his mind, its undue pressure to conform. We are all broken… that says it beautifully Shailaja. I think all of us would agree with that assessment. Where our kids are concerned, we can only do the best we can as parents to bring them up happy and satisfied. Well said, we are all broken, we all are fighting some or the other battle. A bit of kindness, love, comforting words from people around us can make it better and beautiful for us! Very true, we sometimes lose track of the real meaning of life and get pressed down by something so utterly and absurdly simple. Very well written post Shailaja, a must read for everyone who wants to make some sense out of this mad race. Beautifully said, there already are enough 'cracks' in the world, we can do our bit to fix them. This is such an eye-opener for many of us…if we take it in the right spirit, we all can contribute to making this world a better places, not only for the ones we love. Agree absolutely. As long as the academic pressure stays on the kids,it moves to the parents. Time to put an end to it. Now! Exactly my point. Naba. We must also stop people from thinking that they are doing something wrong by not treading the beaten path. Let's enjoy life first and last. Maybe they were just being nice, you never know. It's up to us to help the kids understand that it's ok to say 'I don't know'or 'I have not decided' and be cool about it. Don't you agree? True Aparna. We just do the best we can and hope for the best. And change a terrible decision into a positive one. Thanks Shilpa. Just a smidgeon will do, Kathy. Thank you. I am constantly looking for answers, Keirthana. Hopefully my answers can help other seekers too. Thank you for your warm words. If we can change the lives of children for the better that would be a positive step in the right direction for sure. Thanks Alok! Wow, this really spoke to me because I am in a place right now where I am trying to put things back together in my life – I needed this! I also love the pottery, the entire idea behind that art form is lovely. So well written, Shailaja. I'm glad to see so many comments here in support of your post. Depression is a brutal experience but we now have so many tools to cope with it if we can overcome the stigma, which requires the support and understanding of adults, especially parents. Thanks for sharing this thoughtful piece. I think this might be my favorite thing you've written. The subject is so difficult. But I love the idea of the broken bits being sealed by gold. It's beautiful. Thank you Cheney. I hope more people and children get to read this and understand that it is okay to be imperfect and that there is beauty in everything. Glad you stopped by. I am too, Meg. I am grateful for all the support. That is one of the best things about being online, in my opinion. As much as I find negativity, I find a truckload of support and love as well. Glad to be here. Thank you for reading. Oh Stacie! Thank you so very much! That is so wonderful to hear! This is the best thing I have read today. I love the way the cracks are sealed with gold, which emphasizes the cracks, but in the most beautiful way. Our cracks make us stronger, braver and resilient. There is no need to hide them. However, the story of the kid saddens me. I had not heard of this as I am pretty much cut off from Indian media. I can't even imagine what the parents must be going through. I am sending prayers their way, whoever and wherever they are. I agree with you, Shantala. There is no reason to hide our cracks. We are beautiful the way we are. The kid's story will haunt me for a long, long time, I'm afraid. Thank you for reading and sharing. I hope the parents' find the strength to get through this. Fixing or rather healing the cracks with gold is a beautiful way of telling that cracks are okay and not ugly. It's said no two children are same. Then why is our education system is so rigid expecting students of varying degrees of intelligence to take one exam? Vry true, kalpana. We are all beautiful in our own way, are we not? Perhaps it will take time and understanding for everyone to come to terms with this situation. Let's hope it happens soon! Good one Shailaja.Nothing or No one needs to stay broken.And we don't have to hide the scars too.Acceptance is the key here, I would think.The learning from an experience however bad- is the golden streak that should bind us together to emerge more beautiful as in Kintsukuroi.Working with sexual abuse victims I find so much meaning in this art form. It is just not an art form but a big lesson in life in my opinion.